With over 50 years of worldwide experience, Yamaha continues to set the benchmark when it comes to designing, testing and manufacturing generators. The Parallel kit (also known as Yamaha Twin Tech Cables) allows you to quickly and easily connect two identical Inverter generators (either 2 x EF2000iS or 2 x EF2400iS) together to combine their output. The cable connects to parallel jacks on both generators. Note that the two generators must be the identical model. The cables feature durable over-braided construction, 45-inch color-coded wire leads, polarized IP30 banana plugs and flexible-tip construction that resists breakage and stands up to punishing everyday use. For the EF2000iS, when two generator models are combined and connected via the kit, the peak output is 3600 watts and continuous output of 3000 watts. For the EF2400iS, when two generator models are combined and connected via the kit, the peak output is 4300 watts and continuous output of 3800 watts. Starts really easy. Good quality product and easy to service / operate. No guessing needed and no poorly translated instructions or cheese-grade parts. I went for Yamaha because I'm likely to only occasionally use the genny and will be relying on it to 'just work' during the Queensland cyclone / storm season. Another tick on the 'man card' as far as wifey's concerned (but she's comfortable starting it too). No messing about, very simple ordering and communication. Received tracking info same day and shipping was much quicker that estimated - especially the week before Christmas. No need to email back or phone about anything. An awesome experience! Purchased on Zip which is always convenient. It was a toss up between Honda or Yamaha! Yamaha won out with the current deal they were offering and at this stage I certainly have not been disappointed. Very quiet and easy to operate and does everything they said it would. Customer service and pricing second to none. My third big ticket item (relatively) through My Generator and all expectations have been met or exceeded. Great people to deal with. Starts really easy. Good quality. Easy to order online , Great service for delivery, product itself is also fantastic, efficien, compact and very easy to use.......love the colour also. Easy process and delivery was quick. Have only been using the Yamaha EF2000IS for a short time. I got if for my boat and its made an awesome difference provides all the the power I need and you can have a normal conversation while its running just out side the cabin. Fast reliable service got it couple days after ordering. Bonus Pack is only on offer for a limited time, while stocks last. The Yamaha EF2000iS is the prized generator for your caravan, motorhome or camping trip. This model is held in the highest regard not only for its excellent quality, but for its super quiet operation and unmatched portability. This is the recommended camping generator by the My Generator Team, and it can be used for more than just recreational purposes. For its power output, it only produces noise levels in the order of 52 decibels thanks to the Yamaha Noise Block Sound Reduction System – this makes it the quietest generator in it class. No wonder countless grey nomads and camping/4WD enthusiasts swear by this model: at that noise level, you wouldn’t even know it was there! It’s compact and sleek design make it extremely popular also: weighing in at only 20kg’s this is a similar size to many competitors’ unit that produce half the power output! The inverter technology means that the power produced is pure and without fluctuation, making it ideal to run all your favourite electronic equipment such as mobile phones, laptops and tablets. Additionally, the Yamaha Smart Throttle automatically adjusts the engine speed in line with the required output, to maximise fuel efficiency. This model also boasts the Yamaha Twin Tech capability to hook up to another EF2000iS and almost double the peak output capacity and provide a peak output of 3600 watts and continuous output of 3000 watts. Other features include low oil alert, electrical overload breaker and easy recoil start thanks to the auto-decompression system. 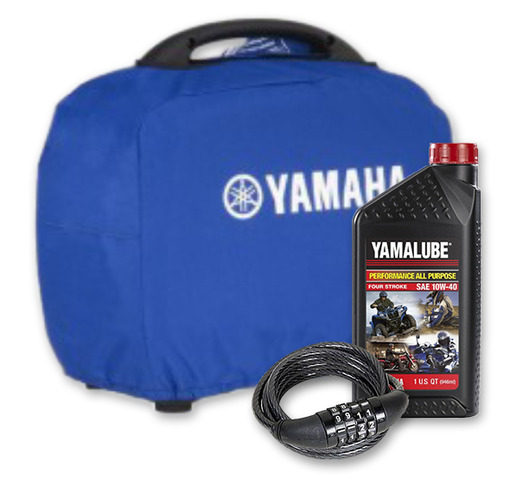 The package is complete with a four year warranty and backed by the national Yamaha service network with over 200 accredited service agents. So, for you next road trip, if you want to power your camping fridge, TV, low-wattage kettles, lights or if you also want to charge your Battery Packs, the Yamaha EF2000iS is the best in class choice! Furthermore, as with most models in the Yamaha range, this unit can be used for multiple applications. Yes, it is the number 1 recreational generator, but many customers also choose this model to run their fridge, lights and TV etc. in the event of a power outage at home. We have also sold this generator to many small business customers, including mobile cleaning businesses, food vans, market stalls and contractors on the go. It's Yamaha's versatility, silent operation and reliability which make it the premium inverter generator choice. Twin-Tech Capability enabling you to connect two EF2000iS’ to alomst double maxiumum output and provide 3000 watts of continuous power (peak ~3600w). Smart Throttle varies engine speed based on load to improve fuel economy and reduce noise. Bought this from My Generator and could not be happier. We use the generator for camping and back up if required at home - I highly recommend it: top quality, easy to move around and does everything I ask with ease. I found my My Generator very helpful with the purchase, the price was good (lead me to them in the first place) and delivered unbelievably quickly. They know their products and the web site is comprehensive. I will definitely use My Generator again. I would recommend the Yamaha EF2000Is to anyone who wants a good 2Kva Inverter Generator. After reading through reviews and obtaining pricing, I found Mygenerator to be the best value for money. No problems, an all good experience. When you are suffering with old injuries just being able to get it in and out of the caravan boot easily is a plus. It works well and does the job I expected. I encountered a very helpful and patient staff member who answered all my questions before I purchased. My Generator people are second to none. Very professional and friendly. Service is excellent. Price is the best around. Other companies could learn a lot from your service provided. This is my first ever generator and its an excellent product. Quiet, easy to start and operate and efficient. I used half the petrol i'd allowed for over the week on the road. The whole process of buying, receiving and then getting running was flawless. Its an excellent product, and an excellent shop. thank you MyGenerator ! Excellent build quality . Functions have been well thought out compared to the Honda. Works as stated. My only criticism is they should provide the Hour/Rev counter as standard instead of having to source it from a third party. The Yamaha starts easily and does the job for what we need. Gives us some additional options when camping for extended periods. Not a big fan of generators at camp sites however we were caught out last year with a week of overcast and wet weather which meant our solar set up couldn't keep us charged up. And an unexpected bonus, only a week after it arrived, we had a tempoary power outage at home while the power company changed a pole...the yamaha kept the fridge running. The MyGenerator price was right for this model and the delivery was quick. The deal with the oil and the cover was great as it meant we had the oil to fire it up for its first use when we needed it. Customer delivery mix-up, mine went elsewhere and I received another customer product. Fixed quickly. Not a problem. Excellent quality build and all of the options needed for its use. Inserted oil and she started first time and ran smoothly. The instruction booklet is easy to use and all operations worked as described. It is compact and not too heavy with sufficient output to cover all my needs. Glad I bought it. The gentleman who attended to me was knowledgeable and answered all of my questions. He then took my details, I made the payment and the machine arrived as he said it would. all of his promises were kept. Excellent. Light, compact and will run everything In my Caravan. After many, many hours of review on the Internet, I decided upon the Yamaha EF2000is portable generator. I have certainly not been disappointed. After unpacking and adding oil and petrol, the generator started 2nd pull. It's lightweight, quiet, and easy to use. I particularly like the ability to be able to shut off the fuel and drain the carburetor after use. Full marks to My Generator for customer Service. The Generator arrived interstate within 2 days of order. I need portable power for my involvement with High School HPV camps and for my own camping/caravanning expeditions now that I'm retired. It took me a long while, comparing Yamaha to other market-leading brands. After a month of hard searching and reading /comparing the Yammy won hands down! The EF2000Is is a quiet and reliable high quality power source that I would recommend to anyone willing to spend that extra buck to buy a quality unit. If you want a cheapie look elsewhere. The unit is robust and stable, the power generated is spike filtered and high quality sine wave power so I don't hesitate to charge computers, phones or other sensitive equipment. The Yamaha EF2000Is is now the most important piece of camping equipment I own, and I expect it will out-perform all comers of similar size and quality. My business dealings with My Generator were straightforward and quick. I ordered online and within days I had the unit delivered to my doorstep. During the order process I somehow managed to order several units instead of just one!! I emailed as soon as I realised what I'd done......with half an hour a rep was on the phone to me to sort out my mistake. He was courteous and very understanding of this senior citizens lack of agility with online ordering systems!! Thanks guys, it was a blast!! I'll shop with you again in a heartbeat. Could not believe that when I put the petrol and oil into the unit it started first pull. It is a very well built unit and am very happy. Placed the order on Wed evening and the unit arrived on the Monday of the following week. This generator is absolutely brilliant. Cover, oil and security cable all in the price. Ordered late on Sunday afternoon arrived on Wednesday morning first thing. Not used to that kind of service in North Queensland. You people rock. Will be shopping again for sure. Cheers. Two older gals with basically no idea about gennies (although you can tell we have our lingo down pat!). One value question is more about Yamaha. How they can price a flimsy cover that is branded with Yamaha at $80 I don't know. We are basically promoting their product with that cover. It is not very substantial. Expected something sturdier for a RRP of $80! Maybe they can add an oil pourer to make adding that oil easier. The MYGen site was the most informative and offered the best value. We only required one online chat to get us going (our mistake re the amount of oil). So delighted. This is my first experience with generators and was at a bit of a loss with what to buy. After reviewing information on lots of websites I settled on the Yamaha EF2000Is. Unit performed above expectations - easy to use, reliable and so quiet! I have no regrets about buying this generator and would recommend it to anyone considering purchasing a generator of this output. Great website with heaps of really useful information to make my buying decision. Easy to navigate and when it came to the purchase there were no issues experienced. Generator was dispatched promptly after payment was confirmed. No hassles and good service. I have never had a generator before so I had lots of questions, they were all answered properly and professionally. All I have to say is absolutely brilliant. Buying from My Generator was fantastic. Great service and our Yamaha EF2000s arrived at our door within a few days. The Yamaha does everything we need , starts first time every time and purrs away quietly in the background. I purchased the unit to add to my caravan as a back up to solar panels (in cloudy / wet weather) as the van is all 12v via battery bank, however last night 28/9/16 we in SA had a statewide blackout and the unit was put into service to power up the house and it performed admirably, without disturbing the neighbors. Seamless transaction, item as advertised, very quick delivery, overall excellent. Thank you, will trade again. Great product. Started with the first gentle pull and settled quickly into nice quiet operation. Simple process. Transaction was quick and easy. Delivery in three or four days. Easy to use and fulfils my requirements. Easy place to shop with extremely prompt delivery. The generator was bought on the net one day and I got it the next day 700 kms away. Awesome service thanks, I will be back again. The Yamaha EF2000iS is a great little generator. Fuel efficient, fairly quiet & does everything I need it to. My Generator were quick to ship the generator. I haven't had any problems with the generator, so can't really comment on follow up customer service. Hopefully I won't need any. Its great. Easy to use. Quieter than others. I/we are glad we got this one. Great being portable. The Generator is exactly what we needed and fitted every requirement we had for it. Very good product, reliable and quiet. The transaction to purchase was easy and smooth and very quick. Never had to worry or fuss over the delivery. Awesome, quiet, fuel miser. Great little genset. Only down side is only having one power outlet. MyGenerator: good price and very speedy delivery. Great to deal with. I have had previously a Yamaha 2400 generator, so when it came to buying the smaller Yamaha 2000. it was a simple choice. I have used the new Yamaha generator twice for camping weekends and its compact and starts first pull every time. A great unit that follows in the footsteps of my larger Yamaha generator. Cant ask for better service, had a look on line with good references of My Generator. The price was right I ordered on line and received the generator in the same week with the generator being delivered to my door. Nice and light. It is easy to start and ideal for a woman. We purchased it as a back up against the prospect of power outages due to the dry year and for our camper van. Easy. Purchased via eBay. We had fast delivery and no problems. Great unit, I did a lot of research, (as I do) before deciding on this particular Yamaha Genny. Money well spent, and am confident that I have a quality piece of equipment that should serve my needs for a long time without letting me down. So far living up to expectations. The lower operating noise level of this machine was important and one of the deciding factors as I am mindful of other people's comfort and their desire for peace and quiet. In my opinion one of the most important considerations when buying and using a generator. Professional - could not ask anything more from this business, I think that one word says it all. First portable generator, so can't make comparison to others in this product niche. Quiet enough while not being pressured. Running a pod coffee machine (1200w) certainly brings up the noise level. Not intrusive, just a bit too loud for an early morning chino in a caravan park environment. Awesome experience - phoned up on the Thursday morning to order the Yamaha generator after reviewing the website. Talk through the basics of the product and how to operate. - then placed an order. The generator was delivered to Brisbane on the Friday afternoon. Amazing service. Could not believe it started first time over the moon with the Yamaha. Ordered and paid over the Internet, emailed tracking number. Followed the progress straight to my door. Well done everyone. It been a pleasant purchase. Would recommend dealing with my generator to everyone. My husband thought it was was the best birthday present. We used it the first time camping to run a 70L fridge, it was so quiet, you forgot it was even on after a while and it didn't effect the camp atmosphere at all. It is easy to transport and for a small female, I find it very easy to carry and start. When we are not using it camping it gets used on the farm all the time. So much easier than lugging the welding generator for just a small job. Very happy with it. I was in a hurry for it as we were going camping, so rang mygenerator, they put it on the truck that same day, it arrived the next day, just in time for a camp weekend and my husbands birthday. Great website with a lot of infomation, great customer service and a great price as well. First generator I've owned and very happy with it so far. The mygenerator team have been helpful. Delivery was timely and the price fair. The team team have been helpful. Delivery was timely and the price fair. Wonderful machine, easy to start with frozen shoulder. Light enough to carry, and has made a big difference, we can run anything we want. My purchase was the easiest ever, and sent without delay, arrived in good condition. We purchased the Yamaha for recharging a deep cycle battery for our camping trailer. I particularly like the fuel shut off valve. Very handy for carrying the generator in a car. For the people considering Honda, I'd recommend the Yamaha, as I really think it's a superior product. Also received a useful cover and lock in the package. These have proven to be quite handy. The product arrived in Brisbane within roughly a day of placing the order. All delivered as requested. Called MyGenerator a few weeks after purchasing to ask a question relating to use and received useful advice. Buyers can certainly feel confident that the owners of the company will be there for any usage support. Would be pleased to use the company again. Only one suggestion would be to have an article online to show people how to charge a deep cycle battery using the generator with a battery charger. Maybe also think about selling battery charges on your site. We have found CTEK battery chargers to be very high quality and particularly the M300 model. These could help people purchasing a generator for camping who need to learn about how everything works together. Only a suggestion at any rate!! This unit is absolutely perfect for my application. It is used mostly for a backup when camping with the caravan. I was very happy with the whole online process and cannot fault My Generator. I spoke to them on several occasions before purchasing the generator and was very impressed with their freindliness and knowledge. My order arrived a few days after placing the order. This was the best price I could find at the time of purchase. I give you full marks for customer experience. Hi, I read many reviews before buying my Yamaha 2000 watt generator and felt very comfortable with what i was reading. Since receiving my generator which was delivered very quickly, i have had no issues with it. i did make a phone call to My Generator regarding exactly which oil to put in the generator before first use, but once again the answer was there for me. As far as internet sellers go, My Generator would have to be the most accessible by phone, the most unbiased and helpful in product recommendation and also after sales service. I have proudly recommended My Generator to people who hire my boat and also friends and family. It was noted to me also that my friend had purchased the same generator and paid quite a bit more for it. For anyone that reads this, please just go ahead and order your product from this well organised and service orientated business. Kind Regards - Andrew Thirkettle. Not a lot of chances yet to put to the time test, but from day one, fuel. oil and 1 pull on the cord for a quiet start and smooth running. Have had a number of Yamaha bits of gear over the years and have never been disappointed. They provided a very good customer experience. We could have bought a cheaper brand of mobile inverter generator, but on reading all the product details and specifications (which were set out clearly to read) the Yamaha EF 2000iS generator was the best and most appropriate for our needs. It is also extremely quiet for a generator of this size, and an extra bonus is the four year nation wide warranty. We cannot fault this generator, and would highly recommend this product. Extras as advertised (Cover & Security cable). Warranty. Oil/fuel up... started first go. Super quiet. I mean super quiet. No regrets paying for a quality product. Purchased as back up for Caravan. Works great and does exactly what I want it to do. Good service and kept in the loop throughout purchase through to delivery. Would purchase from this company again. The unit is currently running on the back of my boat to charge up hot water system…..love it. Have found it easier to start and quieter than the Honda, which I had on my previous boat. Honda offered me a better deal but I wanted to try out the Yamaha given its good reviews. In Eco mode it does not disturb boats close by, especially if you have to run it at night. Have only run it 6 hours since new but already loving it and have called it "Bernie"
Best price I could find. Friendly staff and prompt service. Have already recommended to several friends heading away on their boats. Very happy with this Genny. I put some oil in it, put some fuel in and it turned it on and it started first pull. The low load setting works a treat. I will be using this machine with my caravan when I free camp. It will do everything I need it to do except run my air-con which I knew anyway. This machine is more expensive than most others and only time will tell if it was worth the extra cost. My Generator was a pleasure to deal with and answer any questions straight away. Bought this genny for my caravan to run the A/C ( approx 5.8amps ) - this unit runs well with no hiccups - and so easy to start ! Fits perfectly in the front box of my Kimberly Karavan and operates the van electrics comfortably. Easy and quiet operation with professional finish and looks. Will be perfect for on the road as well as household backup. The purchase from My Generator was well sequenced with quick delivery and efficient contact keeping me informed of the whole process. I bought this as a backup supply for my caravan. It handles my Air Command air conditioner. It is also the maximum size allowable in QLD national parks and also meets their noise requirements. I also need it as a backup supply for my house, so is am very happy with it. The service is fantastic, quick delivery and the price is unbeatable. Our research prior to purchase of this generator was sufficient to give us confidence that we have bought the best generator for our needs. The advice given to my partner Michael on the phone prior to purchase was excellent, and the delivery time was just as advised. We are very happy with the whole process and have no hesitation recommending this supplier to other buyers. Am so happy with my Yamaha 2000 , looks great, easy to carry, started first pull after filling with oil and petrol, super quiet compared to my previous gennies. Love the fuel cut of switch! We don't use a generator a lot as our van has solar panels but it's great to have confidence in a unit if and when I will need to fire it up. After sifting through tons of adverts, eBay ,etc My Generator just seemed to come up with the goods, I ordered the unit over the web on a Friday night ,received a phone call Monday morning, and the gennie was delivered to my neighbours door on the Wednesday! Now that's what I call good service, and all less than what I could purchase one locally if I picked it up myself! After receiving the unit I posted off an email regarding the warranty, no sooner pressed send and my phone rang replying to my email. My Generator have got service with a smile just down pat in my book! Well done guys. John. After sifting through tons of adverts, eBay ,etc My Generator just seemed to come up with the goods, I ordered the unit over the web on a Friday night, received a phone call Monday morning, and the gennie was delivered to my neighbours door on the Wednesday! Now that's what I call good service, and all less than what I could purchase one locally if I picked it up myself! After receiving the unit I posted off an email regarding the warranty, no sooner pressed send and my phone rang replying to my email. My Generator have got service with a smile just down pat in my book! Well done guys. John. Excellent generator. Anyone who buys one won't be disappointed. This is my second Yamaha. The first being a 1000i. I was happy with the first one but even happier with the 2000i. This one is quieter too. Couldn't wish for better. Prompt delivery to the door. Well with the wait until the shipment arrived. Congratulations all round. Excellent product all round. Easy to start and runs well. Generator was delivered to my door. NO issues with the product which is to be expected when you invest in Quality. Was quieter than I thought it would be so that was a bonus. Being the owner of a business that serves thousands of people around the globe each year I understand the importance of clear and concise communication with customers, The guys at my Generator impressed me with their professionalism and especially communication. Runs well; very quiet; extremely economical. Wasn't loaded up but ran for 14 hours on 2.5 lts fuel. Had fridge, freezer, lights, charging battery, stove all going. The generator is compact, very well made and extremely quiet to others I have heard and used. The old saying of you get what you pay for is very true with this brand and would not hesitate recommending it to others. I read the instructions, put the oil and fuel in it and it started effortlessly first go, thats what I want and expect for the money I paid and was not disappointed. Great service with excellent advice, pleasure to do business with you and will definitely recommend your business, thank you. Easy start , quiet when running , good for our caravan , Light weight. Good company to deal with, quick delivery. First I must say I did not buy this generator from MyGenerator. I bought it some 3 years ago as an emergency generator at the Sydney Caravan and Camping show. I paid somewhat more than the price on MyGenerator. During the recent power outage in Sydney I fired it up for the first time. It started 2nd pull and ran flawlessly powering 2 fridges, some lights and my CPAP (medical device) all night and was still going strong the next day on its first tank. I like being able to run these small engines dry and a fuel gauge is a big plus. Note that I will be draining the fuel tank to avoid stale fuel problems. I have just ordered a new caravan and will be taking the generator with me when free camping. I will need a second generator and connection kit to run the aircon in summer but that will be cheaper than purchasing a larger unit. I think there will be no problem with the park rangers as my exemption due to medical needs and the quietness of the machine should keep everyone happy. The only comment I would otherwise make for anyone considering adding an auxiliary fuel tank via a replacement fuel cap is that the fuel supply on the Yamaha is gravity fed as opposed to the pump on the Honda. This would make it an unlikely add on for Yamaha owners. Sadly I have not had the pleasure yet so can't comment though I will add a review after I purchase my 2nd unit and connection kit. I spent considerable time evaluating the available generators on the market. I decided the benefits of purchasing a Yamaha EF2000iS were very clear by comparison. In fact I convinced my travelling partner to buy one just minutes before he bought another brand. It does every thing I expected and even easier than I imagined. It runs the Coleman Mach, on my Jayco Expanda, on cooling cycle, easily, noting that the revs to operate it are well below full revs. I was very pleasantly surprised, because it ran flat out on the heat cycle. I do not use the heat cycle. From the first contact until the first pull on the start cord.....brilliant. I had a small hiccup with the freight company but that does NOT reflect on Steve. I wonder how Steve manages to talk to ALL his customers, because that's the way it appeared to me. Good "old fashioned" Customer Service. You cannot beat it. Experience it, you will NOT be disappointed. Happy with the complete service on purchase of this product. Maybe a small container of oil could be offered with sale. Despite the product working perfectly, it sadly does not produce enough power for my air-con unit and cuts out when I start it up... genny comfortably runs my fridges, lights and fan but not the main thing I needed it for. Will now have to buy another bigger toy for the shed! I'd advise to check the specifics before buying rather than go on word of mouth - I now know that my Dimplex portable air-con requires 3000 watts to get going. Good experience - delivered in 3 days. Lighter than our old one, easy to start very pleased and very manageable when doing work on machinery in paddock. My Generator are excellent. Ordered, delivered - all good. We are absolutly pleased with our Yamaha Generator, I researched as I do before any purchase and found that this was the best value for money generator. It has performed as we expected and runs all our gear without any issues. The purchase of the Yamaha Genset has been the easiest purchase I have had ever. I work overseas and wanted to purchase before I arrived home. I sent an email to Steve requesting some information eg, freight, availability and assistance with the $ exchange. I was so suprised of the timely response to my emails and the flexability of the company. Before I knew it, I was informing the wife that we have purchased the new generator and expect delivery around this date. I have reccommended My Generator company to my friends and have expressed to them that if I was to ever purchase another one, it will be through Steve at My Generators. Very impressed. Great product, does everything we wanted from it. Great delivery time, very happy with service. The Yamaha 2000W is a great product. Low noise, low fuel consumption and light enough to easily carry. Very easy transaction. Purchased over the phone and product arrived a couple of days later. Price and service both excellent. This little machine is super quiet and very efficient. Always starts first time runs superbly does the Job! Best support team I have been associated with. From pre sale during and after sale advice and support and delivery, they are the best. They even answer the phone first time every time, well after the sale with continued advice and positive support! The Yamaha 2kva gen is for the caravan and it has performed well. It's compact, very quiet and reasonably economical. Kept the van systems going. Pleased with the overall performance. A bloody good buy. After doing our homework and owning a cheap brand generator, we decided on a Yamaha 2000w, for its low noise and light weight. We love our new generator. The price was excellent and shipping was very quick. A pleasure to deal with, thankyou. Took a lot of research to determine what product would best suit my needs, which is primarily travelling with our Caravan. The research finally came down to two Brands which are both renowned for their quietness and reliability. I went with the Yamaha due to it having a fuel gauge, which is good if you are using the generator for any length of time, and also it came with the DC leads. I am a person who very rarely shops on line as I like to actually see what I am purchasing. My experience with purchasing with "My Generator " was very Professional, helpful and easy, ( even for me ). The price was right and delivery was amazingly quick, even to Cairns. I would not hesitate to use My Generator in the future. All good so far ,starts easy,quiet have only used once but does everything i want. hi steve, this is a great geny easy to start . quiet. easy to carry. good on fuel.the yamma is the ideal geny. Quiet, light, affordable and powerful enough for our needs. Excellent service, rang me back to answer my queries, delivered on time as quoted. The Yamaha EF2000is would have to be the most compact lightest and easiest to use generator in the 2 kva class. Wife loves it she can start and use it by herself when out camping which leaves more time for fishing for me. Arrived in Nth Queensland quickly and in good condition. Great generator, you don't even know its running. Wow, just doesn't get any better. The Yamaha EF2000is would be by far the best small generator I have used. 11 out of 10 on all points. Great deal, Great service. My Generator a pleasure to do business with, thanks guys. Had a week camping in the forest in WA's South West. The 200w solar panel was useless. I set up the new Yammy very uncertainly, (a lot of people hate generators) It was wonderful. I placed it next to the wheels. It purred away quietly for two hours using a 15amp 4 stage charger and giving us enough power to run the Danfoss fridge, lights and DVD player all evening and through til the next day. What a difference to my previous 1kva machine. I have used it twice since and it is still on the first tank -very economical. The eco throttle kept the revs right down for peace and low running costs. First class! Prompt, efficient order taking and dispatch. Excellent price and fast delivery. From straight out of the box (after adding oil of course) the generator started on the second pull, no priming required! This is a complete revelation from my previous generator (which was a similar 2Kw inverter style and only a little cheaper than this Yamaha with its current discounted price. I am so happy with it that I am almost wishing for that next power outage so I can hook it up to the house! Professional website, lots of detail about the product and the fact that they deal directly with the Australian importer was the "deal maker" for me. The package actually showed up 3 days early somehow?? My Generator was a pleasure to deal with and the Yamaha was a great price and delivered to your door with in a couple of days. Hi My Generator My Yammy 2000 inverter arrived on time in excellent condition, gave it a good test out for 5 hours, works well operating a big fridge TV. Plus computer, and so quiet, I would recommend them to anyone looking for a this size of generator. I found my My Generator very helpful with the purchase, price was good and delivered on time. They know their products and web site explains it all well. I would use them again. This has got to be the quietest, most powerful and fuel efficient gen on the market for 2kva use. I have tried the Honda and other brand equivalents and I am telling you none of them come close. This Little unit comfortably powers a coffee cart at almost full load for 6 hours straight with no need to refuel. Great Sales and after Sales service, very fast delivery, and very easy to setup and have running in minutes. I own a small Temporary Fencing Business. We frequently need the use of a Jack Hammer. We were using a 5kw Generator but it reduced the space on the truck for Fence Panels. I came across the Yamaha 2kw generator its size allowed us to store it out of sight and power is sufficient to power the Jack Hammer for our use. It is quiet and compact. The only 2 down sides are that there is no RCD fitted ( you must have an earth stake) and the knobs/switches pertrude beyond the casing so could be damaged in transit. In saying this though I am more than happy with the Yamaha 2000 it is quiet, economical and compact ideal for a lot of uses. Great generator very quite and great for camping. Works well in keeping fridge/ freezer nice and cold and also power for camp lights. Would recommend this great generator to anyone. Awesome job guys, keep it up - cheers! Got a new Yamaha EF2000is, its awesome thanks guys, this unit easily copes with the 6.5 amps of load we put on it from a commercial coffee machine. I honestly believe these are better than the Honda eu20i's as i have used both now. Also to anyone looking to purchase a cheap import versus Honda/Yamaha, the two brand name models blow them out of the water for efficiency and low noise levels. Just wanted to let you know the EF2000is has been working great up here on the Cape. Thanks for the recommendation. Very happy with overall customer experience from initial generator advice through to delivery. Nice change from some other retail experiences! Needed the quietest possible and generator and I reckon this is it. Lightweight and I get plenty of run out of a full tank. My brother has the connecting cables to join up and get double output when we're on the road. A real winner - cheers, Rob. Spoke to Steve online and he gave me the intel for the parallel cabling and specs for the unit. Got immediate responses which I liked. Received 2 days after ordering, can't complain with that! I bought this genny after using a Honda for over 3 years, and I must say that since using the Ef2000is the Yamaha is much better than my old Honda. Both are light and pretty quiet, but the Yamaha has a few added features that make it easier to use. The Yamaha starts no problems when its really cold (unlike the Honda) and you can drain the Carb. This is a big advantage over the Honda. The Yamaha also has a fuel gauge which is handy. Really happy with the Yamaha 2000w. Bought this from the lads at My Generator for my cabin on the South Coast NSW. We run lights, vaccum cleaner and a small pump - I highly recommend it: top quality, easy to move around and does everything I ask with ease. I was very happy with the whole online process and cannot fault My Generator. My order arrived on the Friday after purchasing Monday evening. This was the best price I could find at the time of purchase. I give you full marks for customer experience. I'm a camp drafting official and frequently camp at the meet. My Yamaha EF2000Is is a great addition and runs real quiet - perfect for camping grounds. Starts quickly, runs quiet and powers everything I need to get through the weekend. Q:G'Day - which 2000w genny is better, the Honda or the Yamaha? Hi and thanks for visiting our My Generator site: both the Honda and Yamaha 2000w inverter generators are great products and they both come with 4 year warranties and national approved service networks. However, when it comes to splitting the two units and comparing the specs, Yamaha just comes out on top as being slightly lighter, quieter and more fuel efficient. For more details you can check out our article for an in-depth comparison: Yamaha vs Honda 2000w generator. It’s also worth noting that the Yamaha comes with 12V DC cables as standard, whereas the Honda doesn’t, and the Yamaha has a fuel shut off valvle enabling you to drain the residual fuel from the carburettor, which again, the Honda model does not have. Q: I just ordered the Yamaha 2000 generator. What type of oil do you recommend? Can I buy the oil anywhere? Q:Sean, can you connect two of the EF2000iS generators and make a 4000 watt generator? Q:Can I use the Yamaha EF2000iS to provide temporary portable power to my home refrigerator or freezer in an emergency and to run some lights? If not, what is the best portable generator that can? Hi Greg - the Yamaha EF2000iS is very suited to running the appliances you have listed. It is our most popular inverter generator and used by many of our customers for backup power, as well as recreation or small business requirements. To be certain this model has the capacity to run your fridge, freezer and lights, you first need to know the exact wattage required to run your appliances (both starting and running wattages), this can be found on the product data plate or within the product manual. This will help you determine whether a 2000 watt generator will be suitable for your needs. Once you have the wattage information for your appliances, we recommend you follow our simple step by step buyers guide which will help you find the right size generator for your appliances. Q:I am interested in the Yamaha 2000 watt, but wondering if there is an option to fit a larger fuel tank, to extend the run time? Thanks for your question; The manufacturers do not recommend any extended fuel tank be fitted to their generators, as doing this would void the warranty. Addtionally, for this type of inverter generator, it is recommended that after running a full tank of fuel, the generator should be shutdown to cool briefly, then oil checked/added if required before running again. As an alternative inverter generator which provides longer run time, you can check out the Yamaha EF2800I which has a run time of 17hours at quarter load. Q:Hello Sean,Thinking about buying a 2000w Inverter Generator as I’m about to build a shack on our bush block. It would need to run a concrete mixer, power saw, drill and maybe a couple of other things. Hi Joe, the most important thing you need to know is the exact starting and running wattage requirements of your tools/appliances. This information can be found on the product data plate or within the product manual. Once you have this information, you can determine what size generator you need to run your appliances. We would recommend that you refer to our Generator Buyers Guide which provides a simple step by step guide to help you chose the right size generator for all your appliances. The Yamaha EF2000iS is a great little generator and while most of customers use it for recreational purposes, many happy customers also use it for smaller to medium tools as well. Again, it just depends how much your tools draw and how many of them you want to run at the same time - find out that information, follow our Buyer's Guide and you'll be sure to get the right sized genset! Q:Delivery time to Devonport Tasmania? G'Day - we ship our products all around the country every day, so delivery to Devonport isn’t a problem. For this unit, we hold stock in our warehouse in Western Sydney, so we would advise to allow approx. 4-5 business days from the day of order/payment to your address in Devonport, Tas. Q:Hey, I am looking for a generator to run some 150w LED flood lights. They will be used to light up a playing field outdoors. I am looking for the quietest solution. How many lights could a Yamaha 2000 power? Would this generator be the best option? Hi Sam - The Yamaha 2000w generator has a rated or continuous output of 1600w (with a max of 2000w). This means it could run 10 x 150w lights continuously. Yamaha generators are the quietest in their class and come backed with a 4 year domestic warranty + over 200 approved service agents across the country. Obvisouly if you want to run more lights, you will need to get a bigger generator with more capacity. You can check out the full Yamaha Range, which has models up to 6300 watts max. We accept Visa, Mastercard, PayPal and direct funds transfer. All these options are available during checkout. Many thanks. Q:Will this generator be enough to run my camping equipment? I have a fridge, lights battery charger and perhaps will have some other small appliances like phone and laptop. G'Day - these are very common appliances for camping and usually a 2000 watt inverter generator will be fine...however, just to be sure, you need to determine the amount of power required to not only run the appliances you wish to use, but also the power required to start them (particularly for appliances like fridges with a motor). For many appliances, the starting output requirement can be up to three times (or more) greater than the continuous running power needed. The exact starting and running wattage for your appliances can be found within the product manual or on the appliance data plate. We have a simple step by step guide to take you through what size generator you need right here: http://www.mygenerator.com.au/generators-buyers-guide/ Take a look at guide and just to be certain you can determine whether 2000 watts will be enough to run all your camping appliances. Lastly, both 1000watt and 2000watt generator models are very popular and suitable for charging your camping battery packs, however just me sure to use a battery charger between the generator and your battery packs, as this will appropriately regulate the charge. Hi - a 2000 watt generator is very likely to be enough to charge your batteries via your charger, particularly if you are talking about battery packs for camping/recreation; just double check the specs on your particular battery system to see what the required draw is. This model generator is very popular for recharging battery packs for caravan/motorhome/camping uses. We also recommend that you use a battery charger between the generator and your battery packs to ensure regulated charging. A 50L Waeco fridge will draw less than 100 watts so the generator will have no problems keeping your fridge running. Cheers! Q:I have a caravan with an Air Command Ibis 3 air conditioning unit. The manual indicates the Power Input as 1300W for cooling and 1210W for heating. It states the Rated Capacity as 3100W for cooling and 2700W for heating. Would the Yamaha 2000w do the job? Hi, and thanks for your question. The information in the manual is usually not enough - we advise that you contact Ibis Air Command and speak to their technical department about your particular a/c model. They will know what size generator you need as they have tested all the Air Command a/c models against the leading generator brands. Q:Hello, I need to run 2 wet vaccum cleaners: both require 8 amps max draw, then 4.5 amps running. Also I want to run a steamer which says it takes 1500 watts to start. I thinking of getting this generator my mobile detailing business. G'Day Serge - using the simple formula of: Starting Amps x Volts = Watts, means that your 8amp vaccum cleaners at 240volts will draw 1920 watts at start up, and then drop to 1080 watts running. So if you were to use your vaccums or your steamer one appliance at a time, then this generator would be fine. However, if you wanted to use both vaccums at once, or with the steamer as well, you would need a larger generator. If this was the case and you still required an inverter generator, then another option would be the Yamaha EF6300iS, which is a popular model for mobile business uses requiring multiple appliances running at once. Q:We are in the process of buying a 2010 Winnebago Esperance. Which inverter generator do you think would be best for us. I'm considering the Yamaha EF2000IS. We live in Tasmania but will be travelling to the mainland next year. I'd recommend a Yamaha generator. Yamaha generators come backed with a 4 year manufacturer warranty and have over 200 approved service agents around the country. The next step is to find out what size you require. This depends on the number and type of appliances you intend to run off the generator. Most RV and caravan owners run the majority of appliances off their auxiliary batteries while stationary. When the batteries run low you can charge them back up using the generator and a battery charger. The Yamaha EF2000IS is very popular for this. If you intend to run appliances that draw a lot more power (especially at start up) like air conditioners, microwaves, kettles or toasters, then you might need a generator with a larger power output. Perhaps the Yamaha EF2400iS which is great for running caravan air-con units. For even more power, the next step up is the Yamaha EF2800i which has extended run time. Q:I am looking at the Yamaha 2kw to power a 1.6kw Window Air conditioner on a boat. Will the Yamaha run it? If 1.6kw is the load required at peak to start the A/C, then this Yamaha generator will be fine to run it. Just be sure to check that this is in fact the peak load - you can sometimes find this information on the A/C data plate or within the product manual, but often you'll need to contact the A/C manufacturer, speak to their technical dept. and they can tell you how much power at start up your particular A/C model will require. The Yamaha EF2000iS inverter generator is suitable for some smaller sized A/C units in boats, caravans and motorhomes. But for many caravan/boating A/C units, the peak wattage requirement is more than 2000 watts - therefore the Yamaha 2400 inverter generator model is the most popular for Air Conditioners: the larger engine and greater output in the Yamaha 2400 generator suits most caravan A/C units on the market. Q:G'Day, is there a way to shut off the petrol supply so I can run the carborator dry? Have had issues with this in the past on different gensets. Hi and thanks for your question - the Yamaha range has a a fuel shut off switch which is independent to the on/off knob. This means that you can turn off the fuel line when the unit is still in operation, enabling you to use up the remaining fuel from the carburettor. Very helpful if you intend to store the generator away for a while before using again. Q:Please clarify if the DC charger facility can be used at the same time as the 240AC is being used? The manual is a little confusing regarding this. Hi - yes, simultaneous use of the AC and DC power is possible, but wattage should not exceed the rated output. It should also be noted that the DC charge from the generator is not regulated and is mostly designed for 'just in case' situations, i.e. your flat car battery needs a short trickle charge. For full charging of your batteries, you should always use a quality battery charger which connects between the AC output on the generator and your batteries - this will ensure safe and efficient charging of your batteries. Q:Good morning, Karen here from Semaphore Caravan Pk Adelaide SA. We are getting ready for our trip around Australia. We would like to know what size Yamaha Generator would best suit us? We have solar panel set up, duel battery among other things. Hi Karen, to be sure you get the right generator for your Caravan trip, its best to know in a bit more detail exactly what you intend to be running. If you just want the generator as backup option to charge your batteries and a few other small appliances then the most popular generator models are the Yamaha EF1000iS and the Yamaha EF2000iS. However, if you also want a generator to run appliances with a larger draw such as a Caravan air-conditioner, a microwave, a washing machine, a standard kettle etc. etc. then you may need a larger generator such as the Yamaha EF2400iS, the Yamaha EF2800i or the Yamaha EF3000iSE. In this instance you would need to know the exact starting and running wattages of these larger appliances to ensure you get the right sized generator for the particular make/model of appliances you have. The starting wattage of these appliances is the most important number to obtain. You can do this by checking the product manual or contacting the manufacturer of the appliance (we find this is the safest/most effective approach). I hope that helps - if you still need help, please feel free to give us a call on 1300 400 122! Thanks. Q:Whereabouts are the Yamaha service agents located? Thank you. You can also check out this helpful video on generator maintenance tips. For further maintenance help, you should take your generator to a small engine specialist or an accredited generator service technician. Q:Is there a way to shut off the petrol supply so I can run the carburetor dry? Yes, all the Yamaha generators have a fuel valve shutoff (petcock) allowing you to switch off the fuel whilst the generator is operating so the remaining fuel in the carburetor runs dry. This feature is especially popular if you intend to store your generator in a car, as the petrol fumes ill not permeate through the vehicle thanks to the shutoff valve. Q:I plan to leave the generator outside my long term camp setup, what’s your best inverter generator that can handle all weather conditions, especially heavy rain? Hi there, sounds like a nice set up! The short answer is that electricity and water don’t mix. Whilst we are aware that some people run their inverter gensets in all weather conditions, it is not recommended as safe or best practice for your equipment, as inverter generators do not come with weatherproof outlets as standard. Ideally, you would somehow shelter your generator from the rain. But just remember that fully enclosing your generator whilst its running is not an option - generators need fresh air intake for the engine to run and they emit carbon dioxide, so they should never be contained. Overall, some rain protection but also room for fresh air intake and fume emission is what you need. Q:Hello, looking for a reliable generator with invertor...its for camping, needs to be quiet. Would be good if you can recommend? Hi Graeme, we'd recommend a Yamaha Inverter Generator if you are looking for a reliable, good quality inverter generator, 4year warranty and with nationwide service agent support. Yamaha are the lightest and quietest inverter generators in the market and extremely popular for camping/camper trailers/caravans. Yamaha 1000w Generator: ultra light, very popular for charging camping battery packs via a battery charger and for running a few small appliances; laptop, phone, TV, lights, small fridge etc. Yamaha 2000w Generator: extremely fuel efficient, also great for charging battery packs and running a few more appliances or items with greater draw such as fridges or smaller air-conditioners. Q:What is an "inverter" generator? Hi Alison, and thanks for your question. An inverter is a lightweight microprocessor that converts power from direct current (DC) into alternating current (AC). They are a fairly recent advancement in technology from the older style conventional generators. What it means is that the inverter generators produce very clean power which is required to run sensitive electronic equipment such as laptops, mobile phones, camera equipment etc. The other benefits of inverter generators are that they are typically much smaller and lighter than standard open frame style generators and tend to operate at very low noise levels (less than 60 decibels). Lastly, they are also very efficient; their engine speed automatically adjusts in accordance with the required load, maximising fuel efficiency. Overall, they are an extremely popular portable power source for camping, caravanning, DIY tasks, small business uses and home power back up. Inverter generators range from around 800 watts up to 6300 watts. Q:Will this generator run the pump for my house water system? Hi, that is a tough question to answer without knowing more details about your pump. Water pumps come in a range of sizes and some smaller pumps can run on a small 2000 watt generator, whereas some house pumps would need around 6000 – 8000 watts or more!...electric pumps are notorious for having quite high starting loads. So, you would need to find out the peak load (in Watts) required to start your pump. If you cannot find the starting load from the product manual or data plate, you could contact the manufacturer of your pump, or engage an electrician to take a reading. Once you have that all important stating load amount for your pump, you can then choose the right sized generator to run your pump. Q:Hi there, I'm considering a Yamaha, but have noticed several other 'generic' generator brands for around a third of the price and offer similar specs. What's driving the price difference? Great question Craig, thank you! Some lesser known brands have their place, really only for people who will use their generator infrequently - in which case you can save some money. Then there are also many cheap brands out there that are a good chance to break down on your first starting attempt! With Yamaha, firstly - their specs are superior; not only are they the quietest and lightest inverter generators in the market, they are also built to handle more intensive, frequent operation. So with a Yamaha, you know it is going to handle your power demands easily and you can use your unit for multiple applications if required; recreation, home power backup, small business, events etc. It is the premium inverter generator brand in the market. Secondly, with a Yamaha you get a 4 year warranty (which is much longer than the cheap brands) and you get the support of over 200 accredited service agents around the country. Our experience is that the Yamaha after sales support, servicing and parts support is excellent. You dont get a national service network with the cheap brands. Hope that help explains the price difference, cheers, Steve! Q:How frequently do I have to change the motor oil? Product info says to change it after the first 20hrs, and after this first change? Hi, after the first oil change, the recommended oil change time frame is every 6 months or 100 hours of use. Thanks. Q:Can I charge my battery pack from the generator? Hi Adam, and thanks for your question; in short, yes you can. The Yamaha EF2000iS and EF1000iS units come with DC outlets and 12V charging cables and are popular models to charge battery packs. However, it is strongly recommended that you use a battery charger to charge your battery pack - the DC charge from the generator is not regulated, and so it is much safer and effective to connect a battery charger to your generator, and then the charger to your battery pack to charge up. The charging cables can be used directly to provide a small trickle for a short period of time in situations such as needing to start a car battery...but once again, for charging your battery packs, ensure you connect a suitable battery charger between the generator and your batteries. Q:I am buying a Yamaha Inverter Generator from you. If I plan to not run it for a period of 4-5 months, so should I just use a fuel stabilizer? Yes, a good fuel stabiliser will keep your fuel fresh during periods when you are not using your generator and in your case this should be fine. Start up your generator every few months for a short period to lubricate internal parts of the unit and even apply a small load to the generator ensure everything is in working order for when you need it next. Hello - thank you for your query. Yes, all Yamaha Generators have a four year consumer warranty which would cover recreational/camping use. The owner's manual lists the full details of the warranty which you can download on the product page on our site. Q:Looking at buying a new caravan, and generator. Never had a geni before. A number of caravan vendors have suggested buying a geni larger than the 2kVA as the new air cons can require more than 2kVA, I would appreciate your advice on this? Hi there - yes, this is a very common question. The best generator for Caravan Air Conditioners is the Yamaha EF2400iS - it will handle the start up load of Caravan Air Conditioner units. As you mention, most Caravan Air Con units will require more than 2kVA at start up. Some 2kVA generators will run some Caravan Air Con units, however we find that when the outside temperature increases, 2kVA generators will struggle with the Air Con start up loads (as every generator loses power capacity in hotter temps). So, for caravan Air Con units, we recommend the Yamaha EF2400iS. Q:Hi, Can the Yamaha 2000w generator power a desktop PC? If yes, then; A) How many desktop can it run? (Note-these PCs will share 1 monitor). B) How long will the power last to run x number of PCs? C) Once the generator runs out, what is the next solution? Hi - firstly, yes the Yamaha EF2400iS can power a desktop PC. It is an 'inverter generator' meaning it provides pure sine wave power; this is a clean type of power that is suitable to run sensitive electronic equipment, like your PC and monitor. The Yamaha EF2400iS provides a continuous power output of 2000 watts. So it depends on how much power your particular PC’s draw. A standard PC will only draw around a few hundred watts (give or take) – so once you find out how much your particular PC models draw, then you will know how many you can run at any one time from the Yamaha EF24000iS. For your type of requirement, you may want to look at a UPS (uninterruptible power supply) device - it will provide near-instantaneous protection from input power interruptions, by supplying energy stored in batteries. A backup generator can then provide power to the UPS after the UPS runs out of its initial power. Sizing and type of generator to backup a UPS would best be advised by an electrician, who would insall the UPS. Hi there, great question. The item that will draw the most power will be your Caravan A/C unit - it would be a good idea for you to contact the manufacturer of your A/C unit, speak to their technical dept. and find out what size generator they recommend for your particular model. We find that the quality Caravan A/C brands such as Dometic, Air Command, Coleman, Denso etc. are very helpful. In our experience, most Caravan A/C units will require a starting wattage of around 2000 to 3000 watts. So, the most popular generator models to run your Caravan A/C unit are the Yamaha EF2400iS and the Yamaha EF2800I. Some smaller and newer/more efficient Caravan A/C models can run on the Yamaha EF2000iS. Again, once you have spoken to your A/C manufacturer, you will be best placed to make the call, however we find that most caravan owners will opt for a 2400watt or 2800watt inverter generator model for two reasons: 1) it gives them some extra power capacity for other small appliances if required, and 2) in hotter environments, any generator's capacity is slightly de-rated, so having a generator with slightly more capability than you need can be very useful as the ambient temp gets well into the 30 degrees and above temperatures. As for your 185L caravan fridge-freezer, this will not draw much power. Most quality upright caravan fridges will only draw around 100 watts (give or take). Thank you. Q:With the TwinTech option, are both generators required to be the exact same? For example two EF2400iS? You can connect two 2000W Yamaha Inverter Generators and increase the peak output to 3600 watts and continuous output of 3000 watts. You can connect two 2400W Yamaha Inverter Generators and increase the peak output to the peak output to 4300 watts and continuous output of 3800 watts. Lucky you mate! This is an easy recommendation: with your 2kVA (2000 watt) generator and size of your RV, we would certainly recommend the Dometic Harrier Roof-top Inverter Air Conditioner. The will easily start and run from your sizzed generator and the size of this A/C model will suit your larger type of RV. Many thanks, and happy travels! Q:I am told by my electrician that to wire this into my home - the generator must not have a "centre tap" - Can you advise if this has or hasn't ? Hi, these portable generators don’t have a centre tap.